On August 21, 2017, the shadow of the Moon will cross the United States. Here in Ann Arbor, we’ll be on the edge of that shadow. Like a sun hat that shades your eyes but not your nose, we’ll see the Moon partly, but not completely cover the Sun. It’s still well worth watching, but DO IT SAFELY! Damage to your sight can be painless and permanant. No part of a partial eclipse is safe to look at directly. Luckily, there are many ways you can safely view it. The easiest way is to use eclipse glasses. The American Astronomical Society has a page with information about making sure your glasses are safe to use. Proper eclipse glasses block out all light except light from the Sun. There are almost no sources of light on Earth as bright as the Sun, so if you can see other lights through the glasses they aren’t good enough. Also, as long as the Sun is visible through the glasses, it’s not safe to look at the Sun, not even if it seems to be a slim crescent. NASA has a page on eye safety during an eclipse. If you don’t have eclipse glasses. 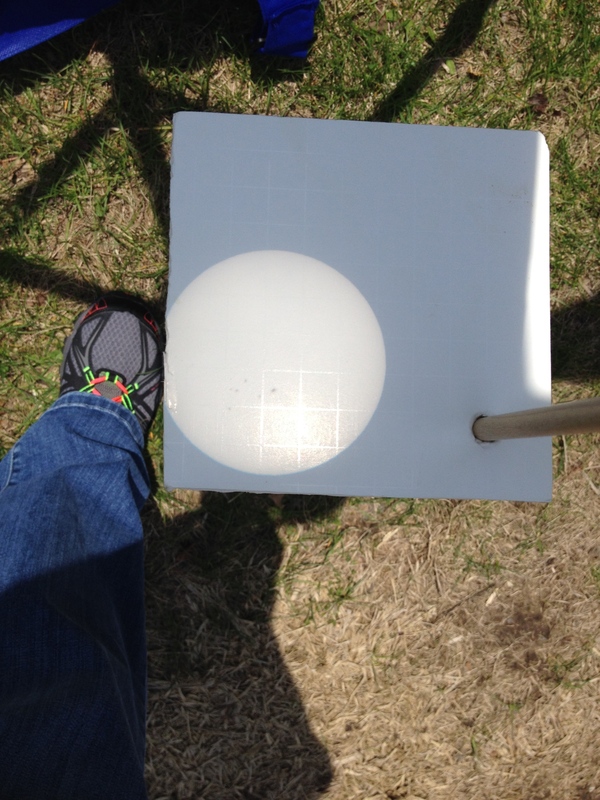 you can view the Sun indirectly with a pinhole projector. The simplest one is to find a leafy tree. The gaps between the leaves create images of the Sun. Check it out next time you’re outside: you’ll notice the bright spots in the shadow of the tree all tend to be round, like the Sun! You can get a little clearer view if you make your own. Poke a small hole in a piece of stiff paper (a cheap paper plate works well) and project the image onto a smooth surface like a wall, sidewalk, or another paper plate. For an even better view, you can make a pinhole camera out of a cereal box or other long cardboard box. Just remember, you’re supposed to look at the image projected by the pin hole, not through the pinhole. If you’d like a little magnification, you can use a small telescope or binoculars to project the Sun. A shade on the front helps make sure the image doesn’t get too washed out. Just remember DO NOT LOOK THROUGH THE OPTICS AT THE SUN! If you don't mind some DIY, you can make sure no one forgets by making a Sun Funnel. This may require a couple days to find the materials. If you have the money are are interested in viewing the Sun on a regular basis, it might be time to invest in a real solar filter or solar telescope. Stick with a reputable company, and a reputable supplier. The list of good dealers on the AAS page linked above is a good place to start. Don’t want to try and do it all on your own? Check with your local library! Many of them are hosting events both to help people prepare for the eclipse, and to watch it on the day of. Similarly, if there’s a state park near you, check their events page. The Night Sky Network, NASA Solar System Ambassadors, National Parks, National Forests, and many others have their events posted on NASA’s eclipse events site. And if you happen to be in Ann Arbor, there’s a few department members who promised to stay in town and will be out on the Diag. If it’s cloudy where you are, you can still watch. NASA will have several channels with live coverage. The Exploratorium will host live streams in Spanish as well as English. Also, check Slooh.com, timeanddate.com and space.com for their streams.